The Thermomix seems to have become a ‘love it’ or ‘hate it’ kitchen appliance for many consumers, and with its high price tag it’s little wonder why the debate continues as to whether it is really worth the money. It’s not a huge surprise as to why there is such an appetite for this machine, as for many time-poor households owning an appliance which does all of the hard work for you is a win-win solution to the everyday challenge of cooking up a decent meal for the family. Marketed as a machine which will combine all your main cooking appliances into one, the Thermomix should theoretically cut back on the expense of those individual items – and save on space in your kitchen. The one-pot wonder not only cooks, it whips, grinds, steams, mixes, blends, chops, kneads, heats and weighs – to name just a few. There is no doubt that it is a quality piece of machinery. The blades stay sharp, the bowl looks like new every time you clean it, and the plastic seals for steaming food don’t get corroded quickly. The downside to this superior technology is that it doesn’t come cheap! Haters of the ‘Thermy’ (as it’s been affectionately renamed by those in the know) would say that the $2,000 price tag is just not worth it. While you can enter into a payment plan – to pay it off in instalments – there is still no getting away from the high price for a gadget which is secondary to your cooker. However, you are paying for quality. Apart from the usual product malfunctions (there will always be a small number of buyers who receive a faulty item) such as needing a replacement sealing ring, most of the complaints come from those who say it simply takes the joy out of cooking. With proper care, the Thermomix should last a lifetime, and when you can replace your blender, bread maker, steamer, scales, mixer and so on with it, maybe this product really is value for money? 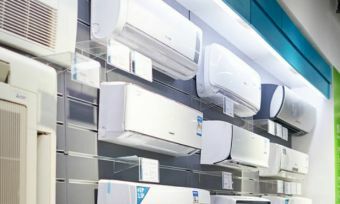 The bods at Thermy headquarters say that by creating food from scratch – such as bread, flour and yoghurt – you are automatically saving money, and with its favourable energy efficient rating, you are also cutting down on electricity costs. So how easy is the Thermomix to use, and how do you become known as the ‘best cook ever’ by your family members? Well, the fact that your $2,000 Thermomix comes with its own consultant is testament to the complexities around this kitchen tool. Those who are opposed to this product also talk of the lack of taste to some of the meals it produces, and that many of the dishes are missing some much-needed crunch. For the lovers, the fact that they are able to serve a hearty, healthy meal for the family by throwing all of the ingredients in and then pressing the ‘start’ button is a no a brainer when considering whether to take that step into the Thermomix world. Thermomix claims to combines the functions of 12 different appliances in one: weighing, mixing, chopping, milling, kneading, blending, steaming, cooking, beating, precise heating, stirring and emulsifying. Apparently, owning a Thermomix will turn recipes you’ve never tried before (because they seemed like too much effort) into easy and fun achievements. Meals that once took your grandmother several hours to prepare are now just a few buttons away. What can’t the Thermomix do? It may be able to clean itself on the inside, but you’ll be left to take care of the outside of your Thermomix. So, we know all about the Thermomix, but what about its rivals? What other know-it-all appliances are out there to help make kitchen life even more convenient? With a $1,699 price point, and large 2.5L capacity dishwasher safe bowl, the Tefal Cuisine Companion is a big competitor to the market leader. This product is particularly popular amongst those with a lot of mouths to feed. It features six automatic programs and a manual mode to adjust speed, heat and time for your own recipes. 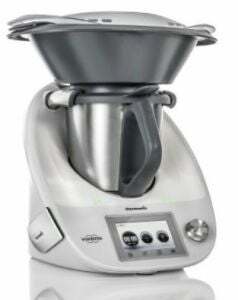 In addition, it comes with four blade attachments that allow you to chop, mix and blend as well as knead dough. You will also find a steam basket and a keep warm function that stays on for up to 45 minutes. 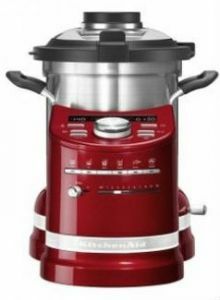 Coming in a little over the price of the Thermomix, the KitchenAid Cook Processor ($2,099 RRP) has been hailed as a big hit for its appearance. With a choice of colours to match your kitchen, this could be a winner for those who rate their appliances on style. Designed with a large 4.5L bowl capacity, expect features such as six auto cooking modes, manual cooking functions and die-cast metal construction. Additionally, you’ll find a StirAssist System stated to gently fold and stir ingredients. Now, if you are looking for value for money in an all-in-one cooking appliance, then the Bellini Supercook might take the accolade – available from as little as $400 at Target. With 13 cooking functions, this could be the machine for the money savvy. 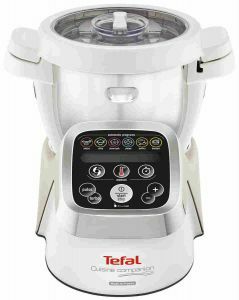 It can operate at up to 130°C and is boasted for 1000W of cooking power with 500W of mixing ability. There are also 10 speed multi and turbo mixing functions to choose from. The large full-colour display and 2L jar capacity is aimed at making this machine a useful tool for any kitchen. 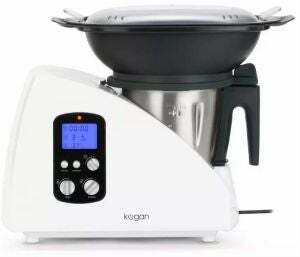 Kogan’s ThermoBlend Pro All-in-One Food Processor & Cooker is another budget friendly option. With a price tag of just under $400, you can combine eight appliances in to one unit. It features an LCD display, timer and temperature dials as well as a temperature control. There are 10 variable speeds to choose from along with a pulse button. This multifunctional appliance provides 2L capacity and is stated to chop, mix, knead, blend, cook, steam, stir and fry. To help with the clean up, the utensils are said to be easy to clean while the cooking bowl is dishwasher safe. In addition, you’ll find a steam tray, lids and measuring cups included. When all is said and done, the Thermomix is a machine with a very fancy engine and the ability to revolutionise how, and what, you cook. But it does cost a huge bundle of cash! Whether you consider it to be value for money really is down to you as an individual. 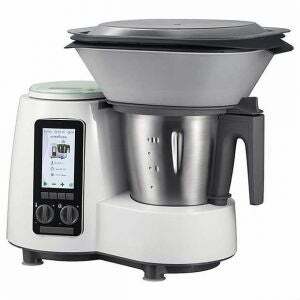 Unlike the Thermomix itself, there is no one size fits all answer.